I see two different suppliers offering a mast hinge assembly...RigRite and Dwyer. I believe Capt.Scott has used the RigRite unit and N41EF has used the Dwyer unit. There is an $11 dollar difference between the two...RigRite is more expensive. 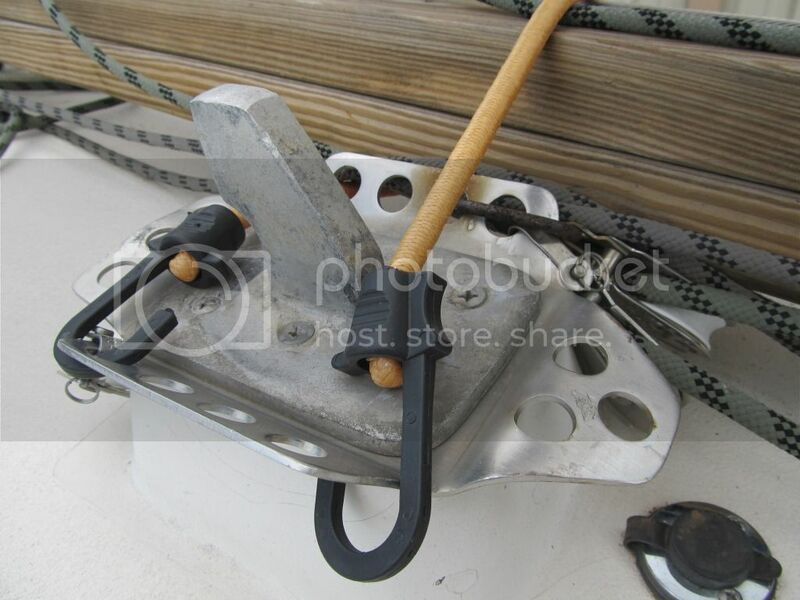 Also the optional halyard organizer plates available, that mount beneath the hinge are quite different in price and configuration. My question is, does anybody know or have an opinion as to the quality differences in these two hinges? Are they basically equivalent? Can't make a comparison, but I can testify to the quality on the dwyer mast step as I just installed one on my O'Day 272. I am very pleased with mine, very rugged. I think it was in the $78.00 range. Do get the plate . . . Very useful! Just a question, Bob, what hinge did you use? I'm looking to add a halyard organizer plate and thought I might as well add a hinge too, as well as finlt install my Windex. Yes, I used the rigrite and love it! 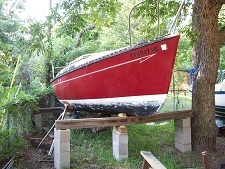 However I have sold the boat that has it! LOL! So, I will replace it with the rigrite again howver I will add the plate next time. Lady Jo has no halyard turning blocks and I would love to add them. Sure would be nice to raise and lower sails from the cockpit! But how are you going to fall overboard if you don't get out of the cockpit? I used the dwyer on the reccommendation of a member here and love it. I removed the bottom step and used it to mark then drill the 6 holes for the screws to mount it down. Also used 5200 between the humm and the hinge because well, being a submariner I don't like water in the people tank. For the top hinge I used three 1/4 bolts from below and nylock nuts inside the mast to secure it. 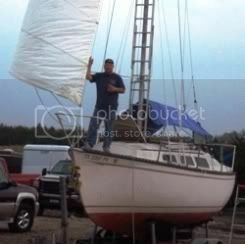 I have the step removed from the mast (to run wires) and made things much easier. 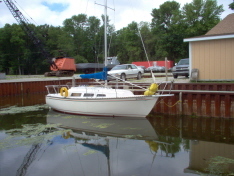 In hind site I wish I had installed a halyard plate too, and may do it next winter. After several solo erections I'll never own another trailer boat without a hinge. I apologize for the late response . . . Divorce just entered my life as I recover from back surgery. I have the stock Selden spars with the stock Chrysler spec hook hinge. I think the Rigrite plate is the one the previous owner installed. I love the thing. I hammered the front and back down to make it more useful. I hope I still own it when the divorce is final. It's regretful to hear about the big D coming your way, hope your back surgery doesn't keep you down for long. Like your plate set up, I will be installing something of a similar nature when I get to this part of my project. Sorry about the divorce, I've been there and it's no fun. 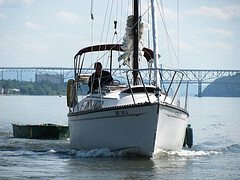 Your mast plate appears to be a Garhauer, http://garhauermarine.com/catalog_process.cfm?cid=68. Of all the plates I've looked at online I like them the best for theor hold pattern and number. Thanks for the picture. Hope your out sailing soon. Thanks guys! 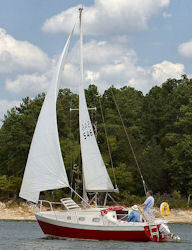 Unless I somehow lose the boat in the divorce my Sailing time should increase dramatically. There's a positive. Sorry to hear of the situation been there and not fun not knowing. Thank you Bob for the photo, sorry you have a ruff time a head of you. I do not know if you have kids. But if you do, the divorce wont be the end. With kids an grand kids you well be seen you soon to be X the rest of your life. I would try vary hard to avoid the divorce. For me the year was 1986 life was good, house nearly pad for, a 32' sedan cruiser in a slip 5 min. from the house. Wife got it all, an I had to pay a big support for kids. But on the good side, I had to work an the more I worked the bigger my pension got. Retired at 51, never having to work for a buck ever. 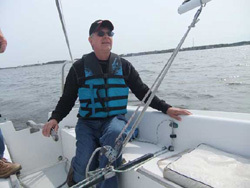 I even take the X out sailing. An for the kids I bring hear back. Chrysler20%26 wrote: I even take the X out sailing. An for the kids I bring hear back. Nice touch... it is always good to hear a bit of humor when speaking on a topic that is indeed a painful bump in one's road of life. Chrysler20%26 wrote: I do not know if you have kids. But if you do, the divorce wont be the end. With kids an grand kids you well be seen you soon to be X the rest of your life. Or seeing her for at least the next 15 years in my case. Living in Big D and experiencing the Big D sadly often go together it seems.